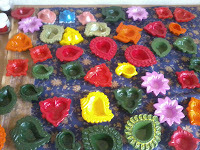 Diyas afcourse ... :) You get them in variety of shapes and sizes in the market. When bought in bulk they come really cheap. 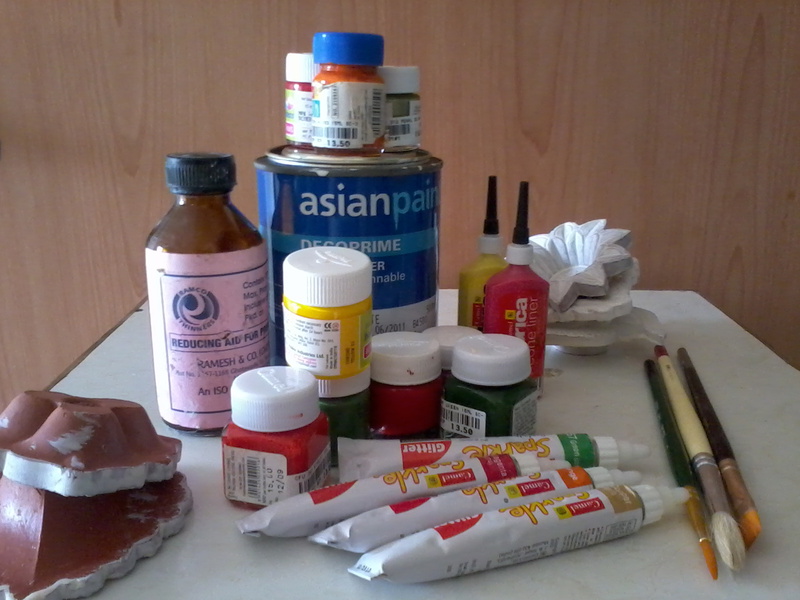 Primer and thinner - this is for a white colored base coat. Colors - base colors would be the usual fabric colors. For detailing, you can select tube colors including sparklers for really good effects. Brushes - larger ones for the coat and base paint. Thinner ones for detailing. Small decorative stick-ons, colored pens et al for decorating the tags. 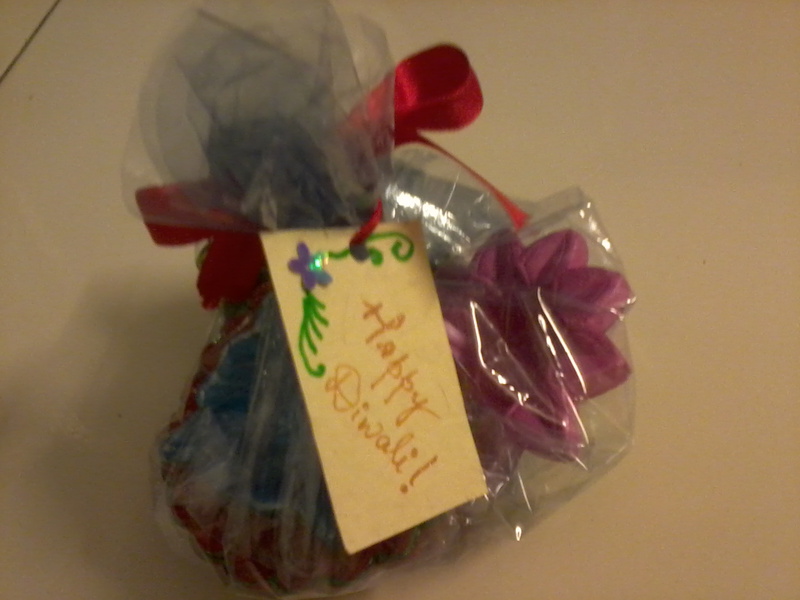 Dip the earthen diyas in a bucket of water and keep them overnight. After removing them from water, keep them to dry in sun if possible for a couple of days. Start with the base coat. 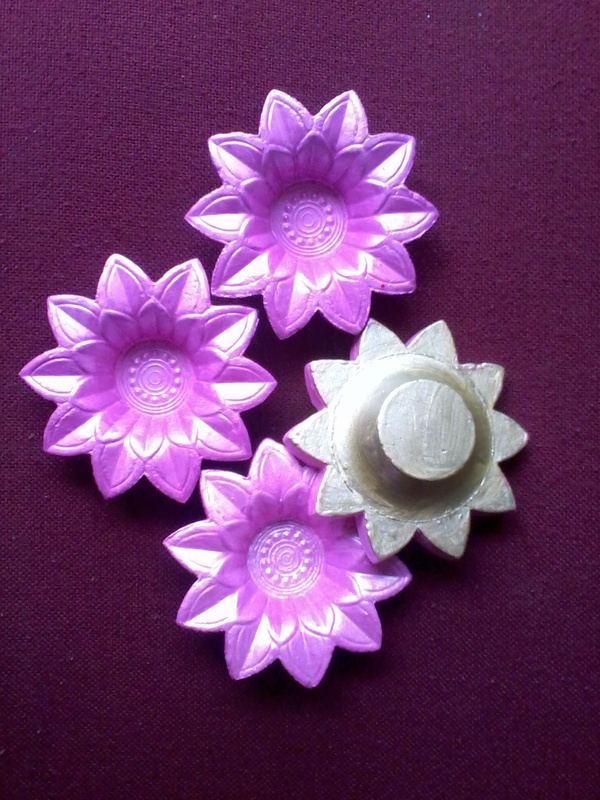 For this we use the primer directly on the diyas. you may require thinner if the primer is too thick. 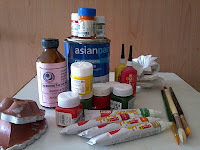 But it is good to have a thick coat so that your base colors will turn out good. Let the first coat dry out completely for a day. If required, apply a second coat of primer if the first coat appears too thin. 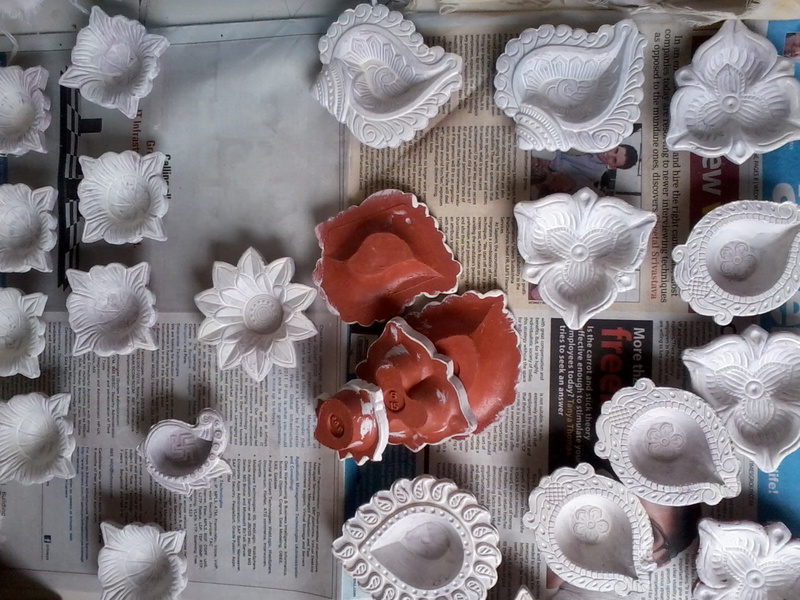 Keep the diyas to dry out completely after each coat. Once the primer is set nicely and the diyas are completely dry, you can start with the base colors. select bright colors like red, saffron, green and blue for the base color. 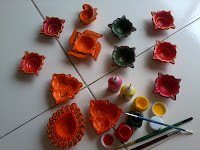 You may need to paint the diyas from one side at a time, allowing time to dry each time. You may also require more than 1 coat of the base color as well. Once the base coat is nice and ready, you can start off with the detailing. Which includes coloring the intricate designs on the diyas in contrasting colors. Its good to keep single base color followed by single colored detailing. You can have multi-colored detailing but in some cases, the end product turns out a bit gaudy. Finally you can add some finishing touches with sparklers to make it more festive. 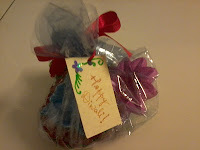 Sparkler colors can also be used for the detailing completely. 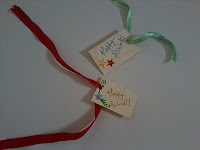 Put single punch holes on the tags at appropriate corners or sections so that we can use them with colored satin ribbons to tie up. Finally place your diyas (2-4 at a time) on transparent plastic sheet (the ones we used as kids to cover our books ... :)) and bunch them like a sweet. 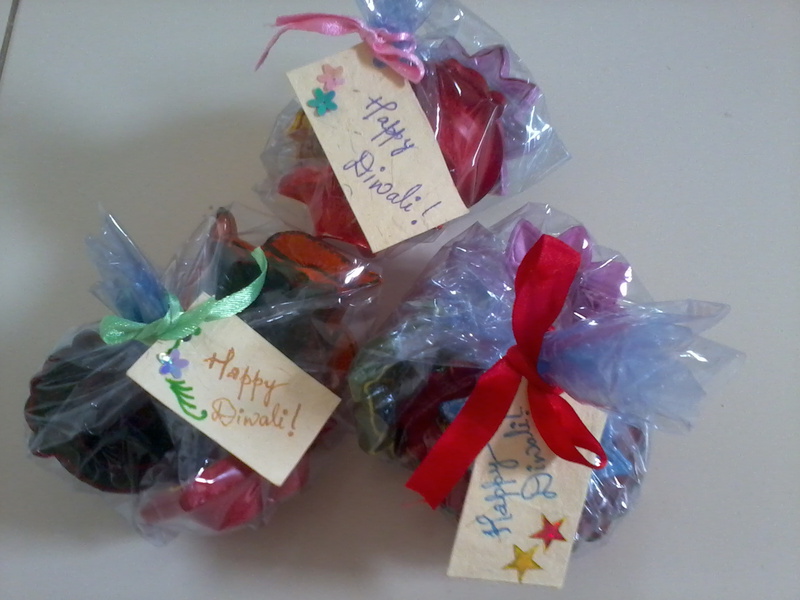 These are so cool Nishi, absolutely love the gifting idea, am going to do them next year for sure!! Thanks for sharing this. Its good. We'll also do this.